We spent 30 summer holidays travelling round the Greek islands in a happy search for the perfect place on the most idyllic island and we think this is it. The romantic Villa Adriana is nearly 200 years old. 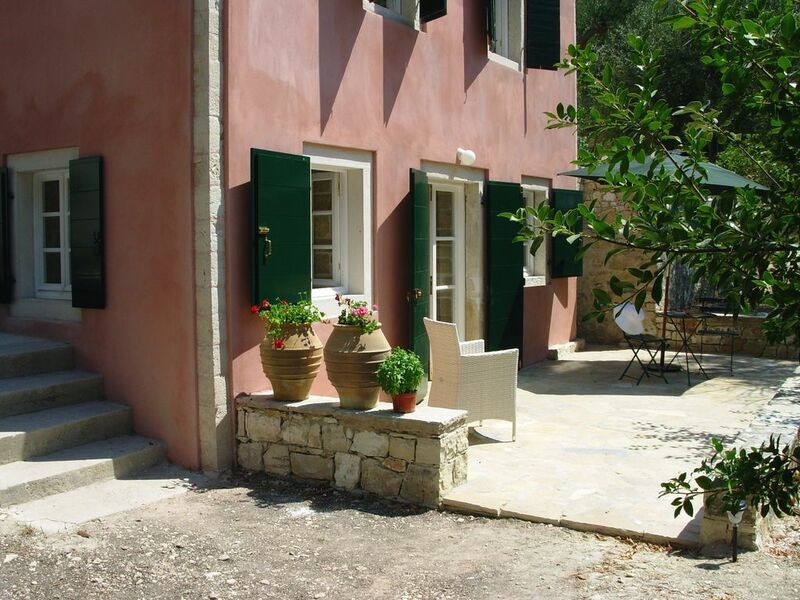 A Venetian, pink-stuccoed house, with thick stone walls, it is one of the landmarks of Lakka, now restored completely. The studio is the lower part of the house. Much of its charm and wonderful atmosphere is due to the beautiful gardens in the midst of an acre of centuries-old olive trees, offering you seclusion, tranquility and privacy. It is very peaceful and quiet, but only an 8 minute walk to the beach with its famed crystal clear waters, and a 5 minute walk to the nearest cappuccino in our lovely local village, Lakka with its outdoor tavernas and shops. And it’s a 2 minute walk to a hotel swimming pool, which our clients can use for free. In the studio, we love reading in the hammocks, having breakfast on the terrace or in the garden, and taking the short walk downhill under the majestic olive trees to the village. At night no traffic is allowed on the small path to the village, so it is always very peaceful. The Studio Adriana, is the lower part of the house. It has its own private entrance, a large terrace and a private part of the large garden. The traditional exterior of the house hides a modern, very light, open plan studio interior that has kept its Greek roots. It is decorated in a comfortable contemporary style, while preserving original features, such as the olive wood lintels and stone window alcoves. Three shuttered windows and double French doors give a luxurious atmosphere of spaciousness and light. All of the windows are fitted with custom-made mosquito blinds. The white-walled open-plan studio has an ochre-coloured floor of local Corfiot stone. The sitting area has two comfortable wicker chairs and a coffee table, and a bookcase with lots of books for all tastes. The dining area has a small marble dining table and traditional Greek chairs in Mediterranean blue. The sleeping area has two hand-made wooden single beds that can be turned into one very large double bed, without the usual irritating gap in the middle. Very good British mattresses. Extra mosquito nets above the bed. A spacious white wardrobe. And wooden bedside tables with specially crafted stone reading lamps. The kitchen area is small, but well appointed, with a marble worktop, an electric kettle, a toaster, a microwave oven and small stove with two electric elements, and plenty of plates, bowls, glasses, cutlery and pots and pans. The bathroom has a walk-in shower. French double doors open out onto a large terrace bordered by flowering Mediterranean plants and terracotta pots full of herbs and bright flowers. The terrace has a large sun umbrella, sun beds, a dining table and chairs, and a large built-in traditional barbecue. There are small piles of olive logs in the garden which you can use for the barbecue to bring a special fragrance to your outdoor cooking. There is also outside lighting for the terrace. No sea view but a lush screen of flowers, shrubs and trees. From the terrace, you can stroll through the studio's private garden under ancient olive trees, or simply relax in the hammocks. You will always have the choice between sitting in the sun or in the shade. A traditional wrought-iron gate from the studio garden leads to the narrow road down the short, steep hill to Lakka village. There is virtually no traffic on this little road in the daytime, and from early evening till the next morning all traffic is forbidden, so it is an exceptionally peaceful and private place. Lakka village itself is traffic free in the evenings too. An unbeatable combination of comfort, stunning nature and architectural beauty. A paradise for nature lovers who want to get away from it all, from serious walkers to honeymooners and other romantic couples. Although both the studio and the villa have their separate entrances, terraces and parts of the garden, it is sometimes possible to rent both parts of the house at the same time. For information about Villa Adriana, please click on the box under "Where, above the main picture. Type in the number 10077402, and you will see the Villa Adriana. Our housekeeper comes twice a week - on your arrival day and again in the middle of the week. She cleans the studio and bathroom and changes the bed linen and the hand and bath towels twice a week too. Clean beach towels once a week. Greek Government Tourist licence EOT1238/TT. We are a Dutch, New Zealand family, based in London and working in theatre and journalism. We spend as much time as possible at Villa and Studio Adriana, our beloved family holiday home. We spent 30 summer holidays travelling round the Greek islands in a happy search for the perfect place on the most idyllic island and we think this is it. Romantic studio Adriana is about 200 years old, has a wonderful atmosphere, surrounded by gardens in the middle of our centuries old olive grove. We have restored it completely: the traditional outside hides a modern, very light, open plan studio that has kept it's Greek roots. It is very peaceful and quiet, but only an 8 minute walk from the beach and a 5 minute walk from the nearest cappuccino in our lovely local village, Lakka with its outdoor restaurants and shops. Our guests can use the large local hotel pool for free. This pool is a two minute walk from the studio. In the studio, we love reading in the hammocks, having breakfast on the terrace or in the garden, taking the short walk downhill under the majestic olive trees to the village. At night no traffic is allowed on the small path to the village, so it is always very peaceful. Huge garden with ancient olive trees and lots of flowers, quiet, very private and still so close to the village. Studio Adriana has its own part of the garden and olive grove. The studio has a large terrace and many secret places to sit in the garden and there are hammocks underneath the trees. The studio is light, airy and large ( about 6 by 6 meters). Open plan kitchen. Ceiling fans, excellent beds, great walk-in shower, good modern indoor and outdoor furniture: an unbeatable combination of comfort, stunning nature and architectual beauty. Paradise. Modern bath room with walk in shower, sink and loo. Floor: local Corfiot stone. The house is an eight minute walk to the nearest beach. From the house it is a 8 minute walk to the village beaches, and a 10 minute walk through a little forest to a quiet beach on the other side of the headland. Lakka is a very picturesque waterfront village. In summer it is one big open air dining room. It has 2 bakeries, a butcher, a green grocer, 2 small supermarkets and the best ice cream on Paxos. The house is in a very quiet, private location, in the middle of it's own one acre olive grove. But it's only a five minute walk to the village at the waterfront: lots of cafes, restaurants and shops. There is a parking place just outside the small gate at the lower end of the garden (nearest gate to the studio). There normally is a good internet connection. Our manager is the internet expert of the island, so help is always at hand. Clean hand and bath towels twice a week, clean beach towels once a week. The studio is open=plan, with a separate bathroom. The sitting area has two comfortable wicker chairs with a coffee table and a small dining table with dining chairs. We provide a welcome pack on arrival. This includes bread, butter, cheese, honey, some coffee and tea, a bottle of water, fruit juice, milk and wine. Sugar, pepper and salt. Herbs in the garden. Pots and pans, glasses, mugs, plates, bowls , knives, forks, spoons, serving spoons, serving bowls, salad bowl, tea pot, cafetiere. Just everything you need to cook and eat. The studio has a small marble dining table and traditional brightly colored Greek dining chairs. There are many books in the studio: mainly in English. Thrillers, literature, poems, Paxos walking guides. We try to make the selection as varied as possible and bring new books every year. The studio has it's own part of the large garden. View from the terrace onto flowering shrubs and large ancient olive trees. Hammocks. Lots of garden furniture. Very quiet and private. No sea view. The large terrace (about 6 by 3 meters) has a built in barbecue, a dining table and chairs, two sunbeds and a large sun umbrella. Outdoor lighting. Large Greek pots with flowering plants. Private. Studio Adriana is in the middle of its own terraced olive grove. Because of the different levels , it is unfortunately not suitable for wheel chairs. However there are good walking paths in the garden, so if you walk with a stick, it's not a problem. Our clients have free access to an outdoor hotel pool which is two minutes' walk from the house. Notes on accommodation: Good quality white cotton bed linen and hand, bath and beach towels are included . Housekeeper: our cleaning lady comes twice weekly: on your arrival day and again midweek. She cleans the studio and bath room, changes the bed linen and the hand and bath towels twice a week too. Beach towels once a week. Welcome pack. Children are very welcome, but the garden is not really suitable for very adventurous toddlers as there are big differences in levels in the olive grove. Outside: The studio guests terrace (6 by 3 meters has a BBQ, sun umbrella, 2 sun loungers and a table and 2 chairs leading to its own gardens with hammocks. The studio looks out onto beautiful ancient olive trees, no sea view. We loved staying in the studio Andrea. The atmosphere and decor are very tasteful and we enjoyed the privacy of the outdoor patio. The location couldn't have been better- a short walk into Lakka and to various beautiful coves for a swim in paradise. Can't wait to return! We had an unusual stay here. We started spending the first week in the studio apartment. We really enjoyed our stay. It is a perfect location for us, 4 min walk up a steep hill but quiet and away from the noise of town. It is very shady in the studio garden but it does not catch the breeze like the main garden above. There was then one of those disasters that can happen anywhere in any house requiring a serious fix of plumbing. As a punter when you book any property you always have a number of concerns, not only around accuracy of description but also around what sort of hosts you are dealing with. Having used H&A and other sites many times, we had mixed experiences previously. However following being informed of the problem Tine and Kenneth could not have done more to resolve the situation (remotely through their on island fantastic support man, Andreas). One consequence of this, was that we were upgraded to the villa for the second week. Well if we loved the stay downstairs in the studio, we thought upstairs in the villa was perfect. With the open feel of the large patios and garden on both sides and a cool breeze, it was perfect. The local tavernas in Lakka are lovely , we tried all except one, I think and we only had one poor dish in one of them. The number of waterside bars and restaurants almost spoils you for choice. Great, almost empty, beaches a short 7 to 10 min walk gives you a choice of 3. The footpath walking across the island is also not to be missed, some lovely old trackways often through shaded olive groves and the occasional spectacular view ( note Each apartment has Bleasedales walking book and map - much has changed since these we printed - I found several paths closed and some news ones opened - so don't take it as a bible of walks albeit very helpful). We rarely if every return to the same area for subsequent holidays but the house and Paxos have changed our views on this !!! What an amazing time spent on Paxos once again. Very sad to be leaving Villa Adriana. I will miss all of it, from the best spinach pies in the world at the bakery, to walking to Orkos beach through the olive groves. We’re leaving well rested and emotionally restored. One of the most striking things here is the atmosphere – relaxed, laid back. You really feel you are on holiday. Just what I needed. I will keep Villa Adriana and Paxos in my heart. A lovely villa in a beautiful location. The Villa Adriana is wonderful place to stay...set in a quiet and peaceful location on the hill top with the beautiful secluded Orkos beach and Lakka both within walking distance and sunset views over Lakka Bay....we had a delightful and relaxing holiday....so much so we booked up the villa again for 2017 as soon as we got home. + Villa Adriana is only a short walking distance with steep hills away from the beautiful bay of village Lakka with good restaurants and nice bars with very friendly owners. + Villa Adriana is also located close to the pebbled beach Orkos with clearest water to which you are leaded through a romantic path. + The walls of the studio have a white new painting. + The WiFi, water, electricity supply was running good. + The owner Tine and Ken are friendly people and you easily can see what effort they put into restoring the Villa. + Ken is a very gifted painter as the studio is decorated with his absolutely wonderful, peaceful paintings showing the ocean. + The information supply is detailed and very helpful. + A pick-up by a taxi was organized which was neccessary as there are only 5 Taxis on the island and the public transportation bus has only 3 stops. - Whenever you enter the studio coming from the outside you are confronted with moldy and humid air in the studio as there is no air circulation though we left the 3 windows open 24/7. Especially in the moldy bathroom was a bad smell. - 1 double bed linen for two people but 2 single, really neccessary mosquito nets is not very practical you had to chose one or the other. - We stayed at the Studio 19 nights. Compared to four other locations we have been in Ionian Islands this is unfortunately not worth the money. Thank you for the compliments. We did take your criticism very seriously so we have thoroughly investigated the points you mentioned. 1) You said we advertise that the studio has a sea view. This is not true : in fact we explicitly say in the “Notes” section on the HomeAway website: “The studio looks out on beautiful ancient olive trees, no sea view”. 2) You called the garden “wild and overgrown and uninviting.” All our guests over the past ten years have loved the garden, which has been carefully cultivated to maintain a natural look, combined with lots of flowers and evergreen shrubs. The result is that, even in August, when there has been no rain since May, we have a green and colourful garden. The grass under the olive trees is kept very short so that it is easy to walk to the hammocks in the studio garden. 3) You complained about dampness and mould. I immediately asked the builder who did the house restoration to come and inspect the studio: he found no dampness or mould. 4) Mosquito nets: the bed indeed has two mosquito nets: but both are large double ones. So you only need to use one for the whole bed. In addition, all the windows have tailor made mosquito blinds: they fit each individual window exactly. 5) You were nearly three weeks in the studio. For two of those weeks we were staying in the villa, so we met you nearly every day. We always asked you if everything was all right, if there was anything we could do, anything that needed changing etc. You always answered no, everything was fine and that you were very happy. We, with our team of manager, cleaning lady and gardener, always try to do everything humanly possible to make sure that our guests are having an excellent, comfortable and memorable holiday without infringing on their privacy. We have many return visitors. The guests who came after you called the studio “This little slice of paradise”. Paxos is a walkers paradise, covered with olive trees , cypresses and wild flowers, it has lots of shade even in August. On the eastern side you can walk through the olive groves to the beautiful secluded beaches. On the western side you can reach the awesome cliffs via good foot paths. Organised walking tours are available One of the best ways to see the island is by small boat. Boats, cars and motor bikes can be hired in the village on a daily or weekly basis. Scuba diving and snorkeling.There are also Greek cooking lessons and yoga classes available on the island. The island has always attracted many artists - painters, writers and actors - because of its outstanding beauty and peaceful exclusive atmosphere. As Gerald Durrell, writer of My Family and Other Animals said, Paxos reminded him of Corfu when he was a boy. 8 minutes walk to the beaches of Lakka village, the first one is a cosy small pebbled beach, the second is larger, with sun loungers, umbrellas and a taverna. 2 minutes walk to a large free hotel swimming pool. And 10 minutes shaded walk takes you to the very quiet, idyllic Orkos beach on the other side of the headland. The whole eastern side of the island has many stunning small beaches. From Gaois harbour: a boat ride to the sandy beaches of Anti-Paxos, a tiny neighbouring island. Fly directly to Corfu: Charter flights, April till November from the UK and from elsewhere in Europe. In winter: fly via Athens: change for the local Athens-Corfu flight. From Corfu to Paxos: a one-hour hydrofoil trip from Corfu New Harbour (10 minutes by taxi from Corfu Airport). Also by boat, watertaxi and ferries. The island is tiny, so all distances are very short indeed. To Lakka village: 5 minutes walk. To Gaois: 7km (4.5 miles). To Loggos: 3km (2 miles). Lakka has 2 small supermarkets with a good selection of fresh fruit and vegetables, an excellent butcher, 2 bakeries, a green grocer and an ATM machine. There are about 15 tavernas and cafes in the village and on the harbour front. Plus the best home-made Italian ice cream shop on the island. In the evening the lively village centre is for pedestrians only. Boat, motor bike and car hire available. You can change money in the village, and there is free Wifi. Gaios has internet cafes and free wi-fi on the main square. Couples: Excellent swimming (the sea is still pleasantly warm in late October). Romantic tavernas. The studio gardens have enough space to give you seclusion and tranquillity. An ideal starting point for country walks. As Paxos is not open to mass tourism, it has the exclusive atmosphere that Corfu – even Agni! - has now lost. Live the romance of 'Mamma Mia!' Young families:the village is very child-friendly (no cars or motor bikes in the evening). The beaches are safe and great for snorkelling or fishing. A family outing in a hired boat is a highlight and a great way to marvel at the awesome cliffs on the west coast. So is a day trip to the sandy beaches of nearby Anti-Paxos. The gardens of the villa are like an adventure playground. Families with teenagers: the villa is a short walk to the village, so your teenage children can come and go by themselves, and you don’t have to be the taxi driver. In the village there is enough social life, and other young people, for teenagers to find it a really cool place. Great snorkeling, boating and fishing. Older couples: as a starting point for country walks, the Villa Adriana is ideally situated. The garden and the surrounding countryside are covered in wild flowers in early spring and late Autumn. We find the sea warm enough for swimming in at the end of October. There is always sufficient shade for walking under the ancient olive trees, through a range of accessible country walks of different levels.